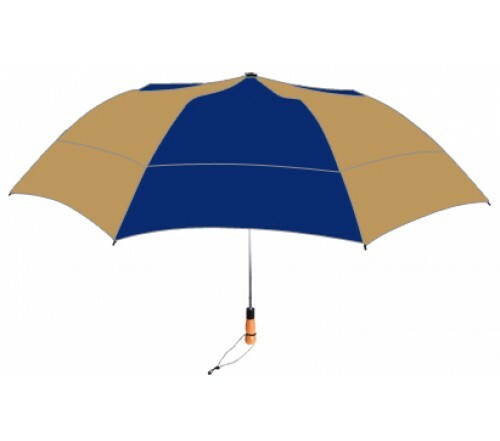 Personalized navy & Khaki 58” arc vented little giant folding umbrella can usher you into busy times with its extreme powerful color profile and it strong wind resistive features. People will notice this large umbrella winking at them and will definitely inch closer to look for information imprinted against it. 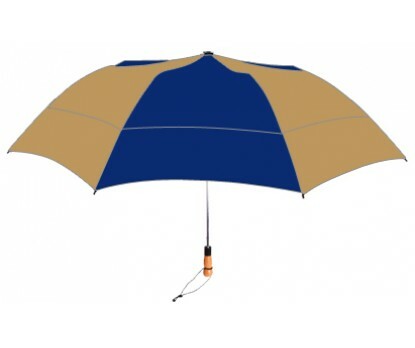 This automatic open function umbrella features a large vented 58” arc navy & khaki canopy, automatic open function, sturdy hexagonal chrome shaft, folds to just 22”, fiberglass ribs, wooden handle with wrist wrap. 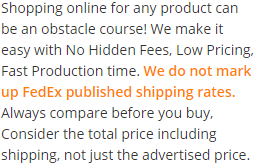 Offered with matching fabric case with shoulder strap. Imprint area - 6”H x 8”W. Available Colors : Red-White, Burgundy-White, Royal Blue-White, Hunter Green-White, Navy Blue-White, Black-White, Hunter Green-Khaki, Navy Blue-Khaki, Teal-White, Navy Blue, Hunter Green, Black, Burgundy, Red, Royal Blue, Purple, Purple-White, Orange-White.